The K framework comes as a bundle of tools. The most important of them are kompile and krun . 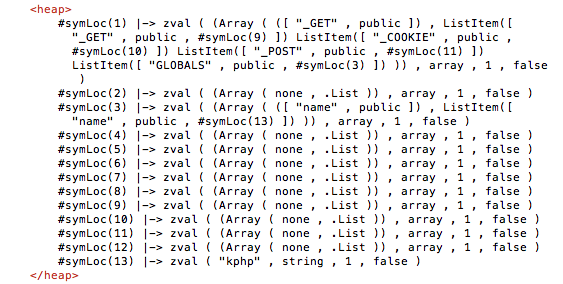 kompile takes a k definition as input and compiles it into a Maude specification. krun is then invoked in order to "run" the definition, by providing as input the program to be run, the parser to be used, and many additional parameters depending on the particular use (which may include an LTL formula to be model checked, the content of a given cell, a path condition for symbolic execution and so on). 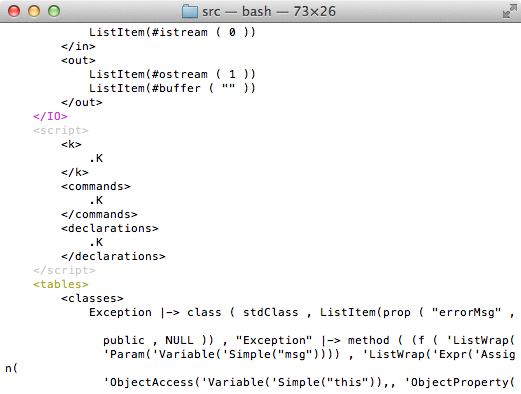 kphp myScript.php For all other cases (model checking and symbolic execution) we use the K toolchain directly. Preliminary note: All the example commands shown here and in the comments in the examples are meant to be executed in the kphp source folder. The simplest scenario consists in running PHP code with the KPHP interpreter. The output, which consists of the program output followed by the configuration in XML-like notationm, should look like this (note that configurations are verbose and span over multiple pages. We give some details in the next subsection). Configurations give a complete representation of the state, by displaying the contents of all the cells. While all the cells are of course needed for the semantics, inspecting some, in practice, is done much more often than others. In particular, there are two cells we find very important: the k cell, containing the fragment of program to be executed next, and the heap cell, containing... Yes, the heap. In normal conditions, the k cell should be empty at the end of the execution. This means that the code didn't get stuck (note that .K means "empty"). Some other times, however, the program may get stuck (either for a bug in the semantics or because the construct that is at the top of the k cell doesn't have a semantics yet). This is easily detected by manually inspecting the k cell. Another important cell is the heap cell, which represent the content of the memory, including the values of all variables, array members, objects etc. Note that, in KPHP, the heap not only contains the values of the variables, but also the scopes (or symbol tables) which are represented as normal arrays (from whose, in principle, are indistinguishable). 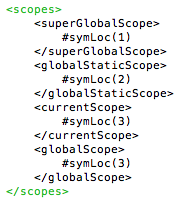 For example, in the previous screenshot, the memory cell marked #symLoc(1) contains (a subset of) the superglobals, while the cell marked #symLoc(3) contains the global variables (in the example program, there was one global variable called $name . Following the same principle, when calling a function or a method a new local scope is created (as an array) and stored somewhere in the heap. The scopes cell stores, at any time, the locations of the scopes. In particular, the currentScope is initially equal to the global scope but is updated to when entering a function body. We provide a small tool, HeapPP , to pretty print configurations. It takes an XML file containing a configuration as input, and outputs a GraphViz (*.gv) file with the same name, containing a pretty-print representation of the relevant part of the configuration (i.e. 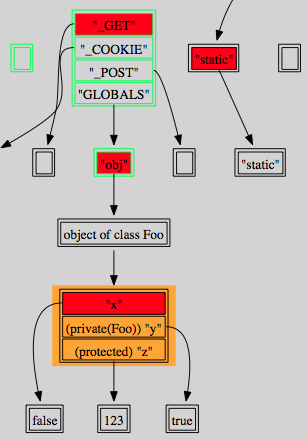 we currently show only the heap plus defined functions and classses). 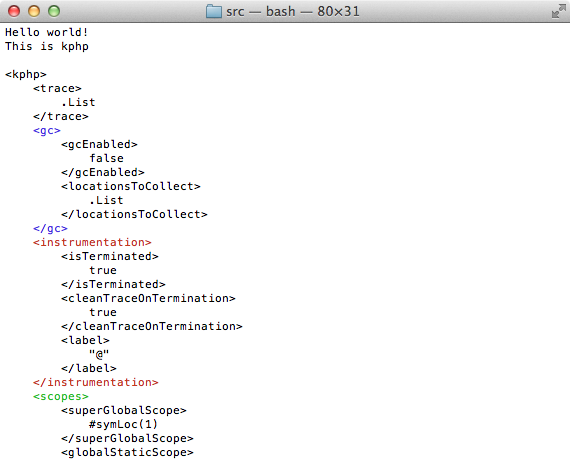 The utility can be found in the heap-pretty-print folder under the main KPHP source folder. Please refere to the README file there for instructions. To give an idea of what's the output looks like, here is a (cropped) screenshot (as configurations tends to be very verbose, this diagrams tends to be too). remove/comment the string stream="stdout" which is inside the "out" cell. This will disable printing on stdout (note that the output of the program will still be present in the out cell, which can be manually inspected in case of necessity. Decomment the string again to restore normal output. However, any number of tags can be used, each combination of tags identifying a different set of transition rules and consequently a different notion of observable program state. For example, the command kompile php.k --transition="step internal" will tell the compiler to also consider [internal] rules as transitions. krun --parser="java -jar parser/parser.jar" examples/hello-world-ltl.php --ltlmc="LtlTrue"
A counterexample given as a sequence of configurations (i.e. the representation of a program execution for which the property is violated). It is possible to specify (similarly as when compiling with --transition ) which rules we want to "augment" for symbolic executions, by using the --symbolic-rules command. By default (i.e. 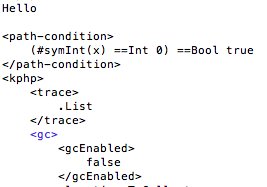 if the option is not specified) all rules are compiled for symbolic execution. some symbolic input: this is done by manually putting some (possibly) symbolic values into the input buffer (i.e. the IN cell): -cIN="ListItem([VALUE 1]) ... ListItem([VALUE n])".